Another week has come and gone and the markets have moved closer to the FOMC meeting and other events that can affect the markets. Let's discuss the latest market action and what the plan is going forward. SPX - This looks like Day24 for this daily cycle and it has a Day 21 peak. We see a swing high in place and this can drop into a dcl. 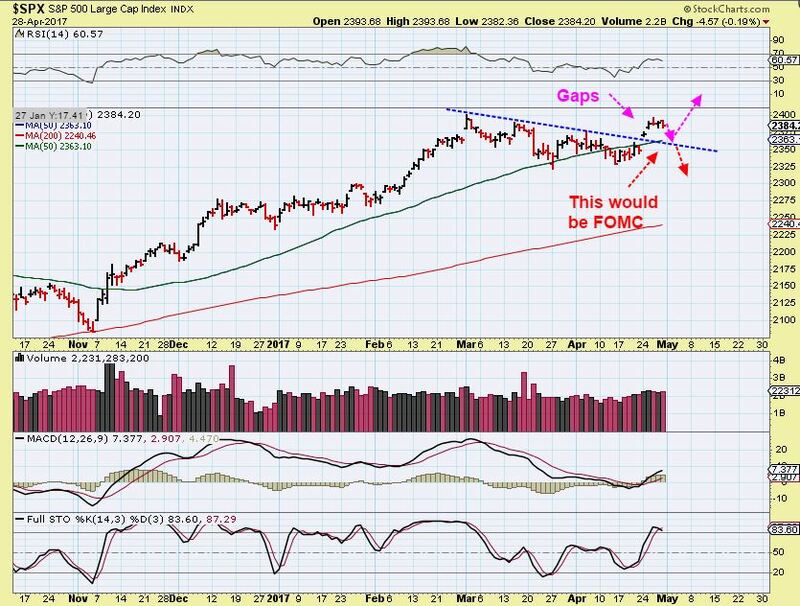 I am expecting some gaps to fill and likely a back test of support and the 50sma into the FOMC MTG Wednesday. 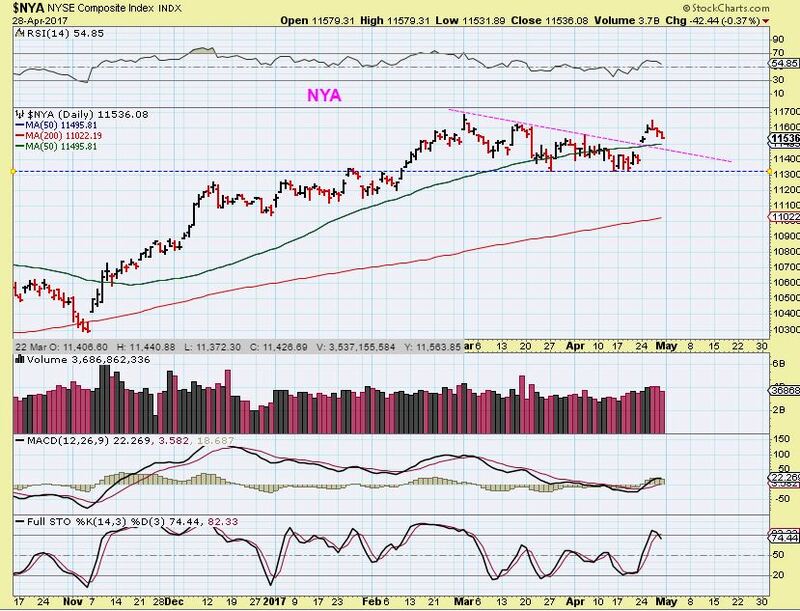 NYA - This looks like a back test so far too, but we possibly have enough time left in this daily cycle to do more than just a back test, so will it bounce around or consolidate? Good question, Danny! That is what we will be discussing in the weekend report. 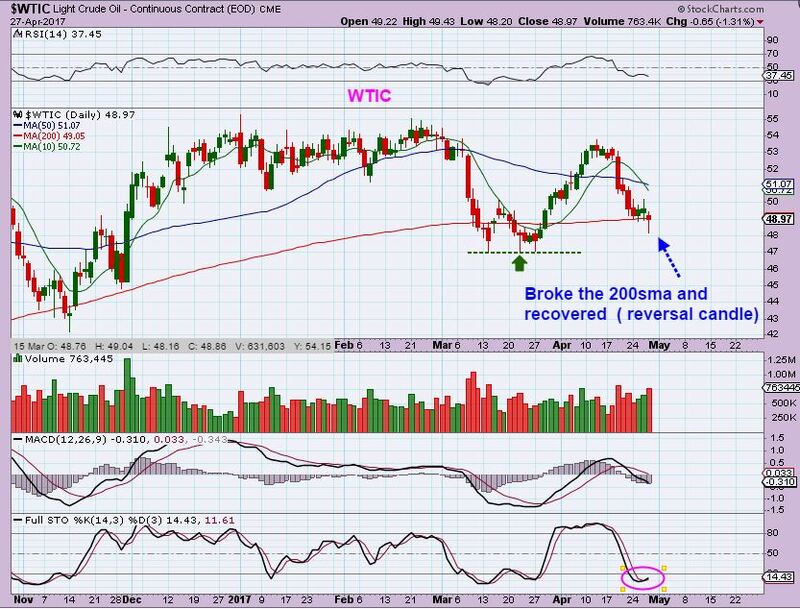 WTIC - Yesterday Oil broke the 200sma and recovered it , putting in a reversal candle. Next Wednesday we have the FOMC meeting. 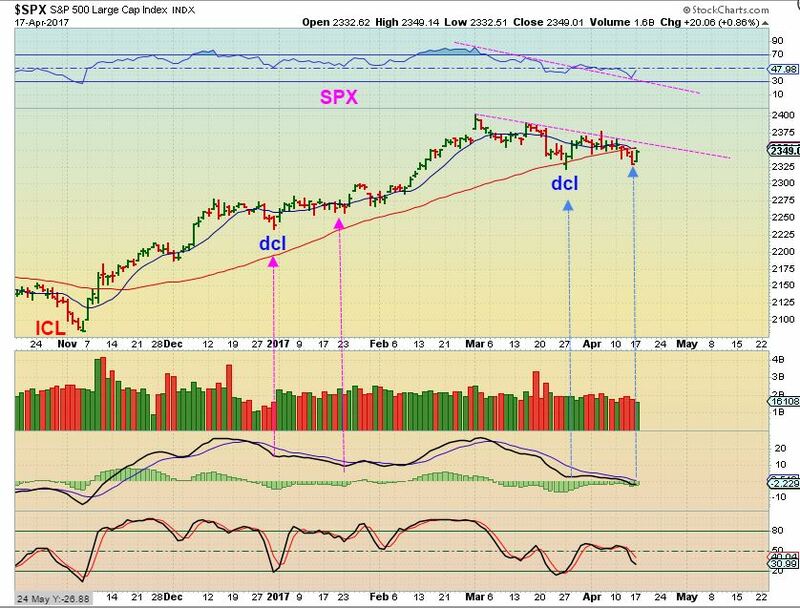 These have affected various sectors of the market in the recent past, so it may just be a matter of time before we see a change take place. 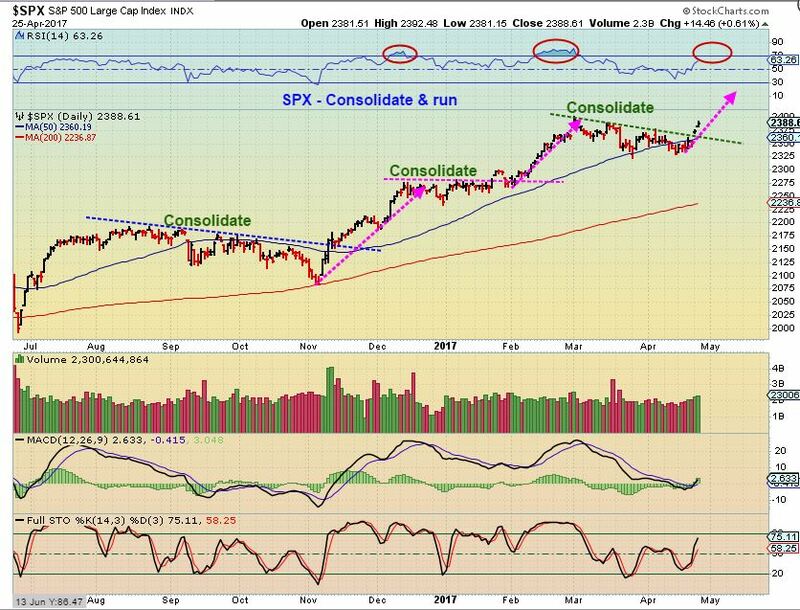 SPX - Consolidations build up steam and can make for a lasting run. These markets could run higher into the Fed Meeting next week. After the 1st round of the French Elections Sunday, we saw price break through many of the trend lines that we were watching. 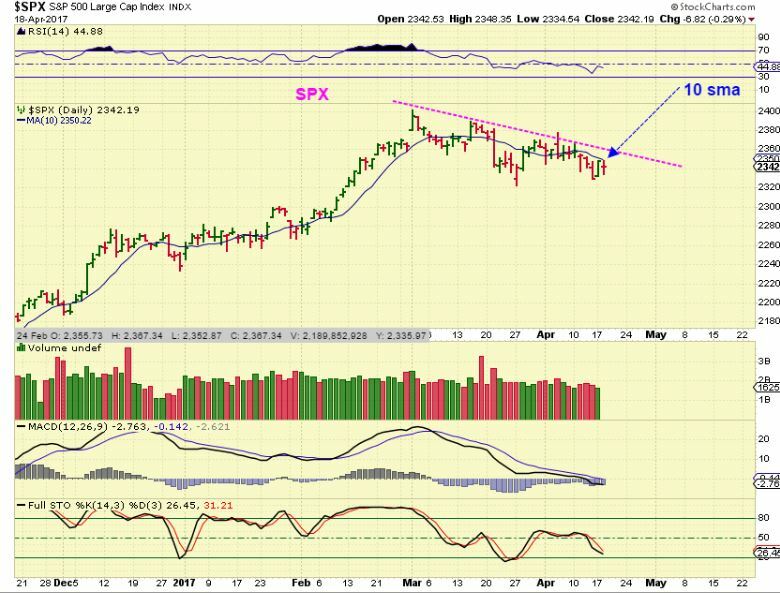 SPX - This chart was from the weekend report showing that trend line resistance for the SPX. And we had a break out on Monday, even if I use the peak of the spike on April 5ths reversal. We've seen daily cycles run various lengths, see the 2 boxes drawn below, and so this does have the ability to run a bit higher. 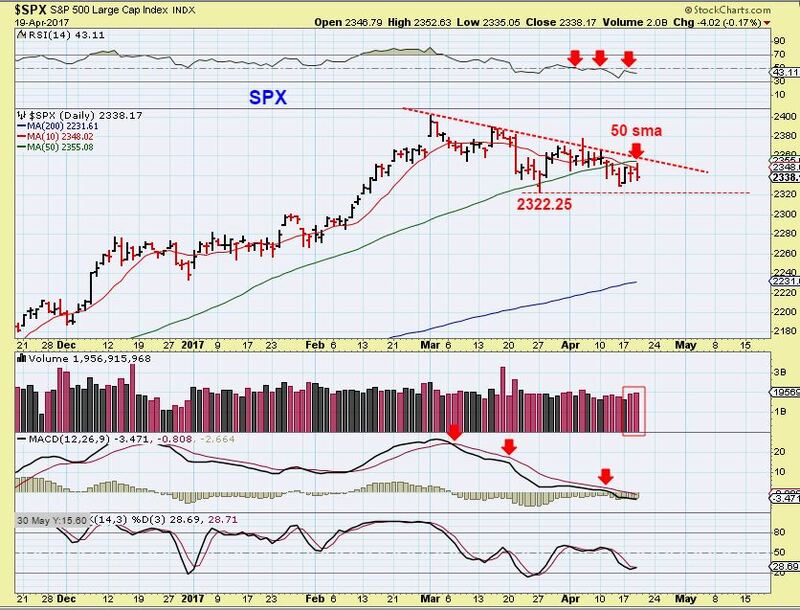 SPX - On April 19th we saw the SPX continue to be rejected at the 50sma. I mentioned watching that 2322.25, because a break out higher or lower is important. 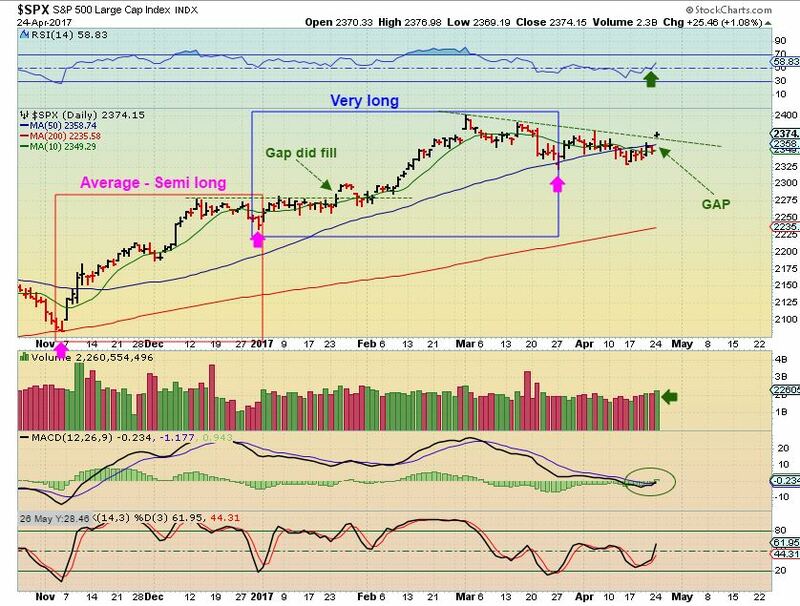 SPX April 21 - No change yet. The RSI & MACD are improving, but no break out yet. 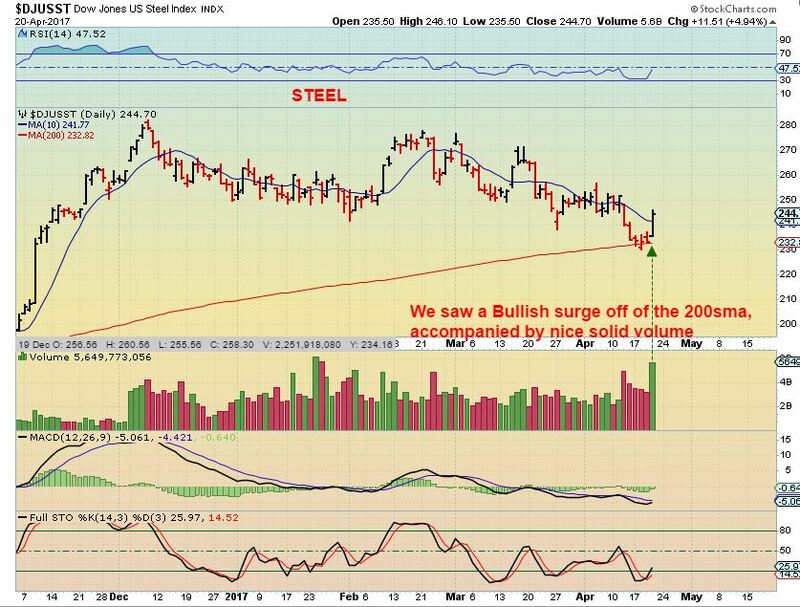 If you were reading the 'comments' or the chat area yesterday, there was a lot of talk about STEEL and the STEEL STOCKS, so Fridays report will discuss that area and some probable trade set ups in that area and other areas. STEEL - We'll start with STEEL itself. We have a weekly reversal and a swing low has formed on the daily chart. After the long multi-month consolidation, the weekly RSI is again above 50% and the Stochastics has reached an oversold level. This all looks good. 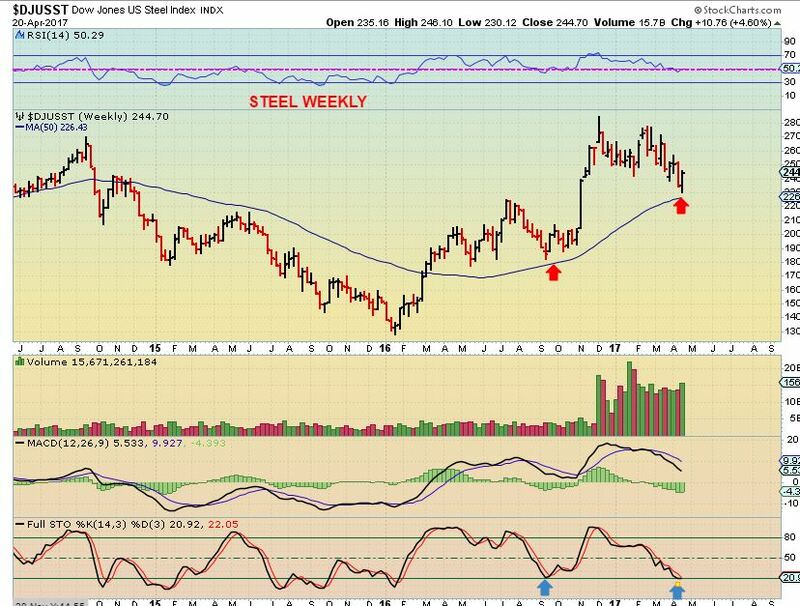 STEEL DAILY - The daily chart had a nice bullish push higher too, and right off of the 200sma. In yesterdays report, I was complaining about the boring 'put you to sleep' type of sideways action in the markets lately. Apparently that was the calm before the storm, because later that day we finally saw some pretty big changes take place all in one day. Something interesting occurred in the General markets, Oil had a big drop of almost 4% (!) and the selling in the many of the junior Miners that I had been pointing out picked up the pace too. Let's take a look at the markets and discuss the recent developments. SPX - Not a lot has changed here, but I've mentioned that I'm a bit concerned with the XLF . Now there are new threats to the General Markets. 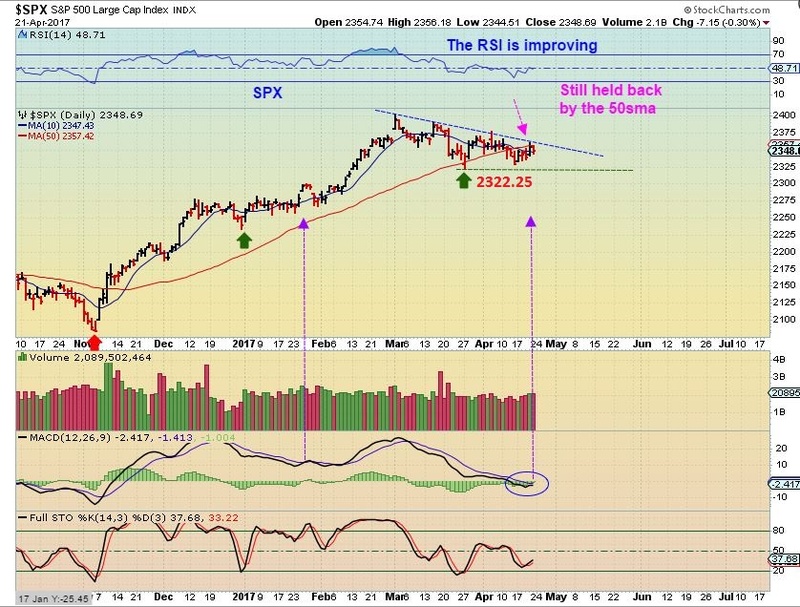 The SPX remains under the 50sma and threatens to break below the prior lows. A break down could lead to a good sell off, and a break out higher could lead to a decent rally, but it is getting late in the 3rd daily cycle, so upside may be limited the longer time goes on. As mentioned in Tuesday mornings report, the Markets have been absolutely fabulous lately ( If you needed to catch up on some rest that is). 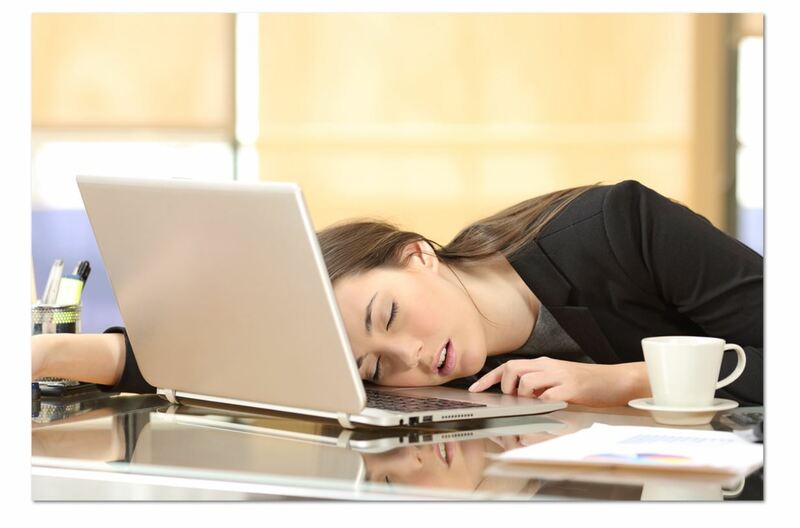 Boring action in almost every sector is putting traders to sleep. let's take a look at what happened on Tuesday! SPX - Here we see that the SPX has basically gone sideways for 2 months. Tuesday it was held back by the 10sma again. No real change here. https://chartfreak.com/wp-content/uploads/sites/18/2017/04/GREAT.jpg 609 1065 Alex - Chart Freak https://chartfreak.com/wp-content/uploads/sites/6/2013/04/black_logo.png Alex - Chart Freak2017-04-19 11:37:292017-04-19 11:40:55THIS IS FABULOUS! Note: That last dcl has not been broken and a break out here is not out of the question, and here is why.